Raymarine's fixed mount Ray90 modular VHF radio brings multi-station communications to a whole new level of power, performance, and flexibility. The Ray90 is a black-box design with a transceiver that can be located out of sight while the ergonomic RayMic handset and remote speaker provide full control of the radio with crystal clear audio. Passive Speaker Accessory A80542: Includes a passive speaker to your wired handset station for crystal-clear audio from your VHF system. 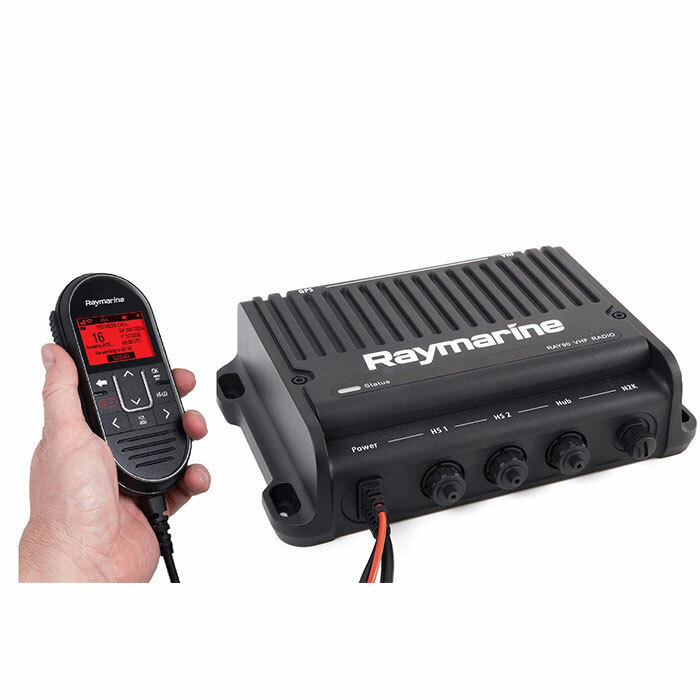 Raymarine's passive speaker kit is ideal for lower-noise areas like pilot houses, salons, staterooms and navigation tables. The unamplified speaker is housed in a compact enclosure that is both rugged and waterproof. The speaker can be mounted horizontally or vertically in any bulkhead or overhead and plugs directly into the wired handset base. Dimensions: 8.4" x 8.4" x 4.5"